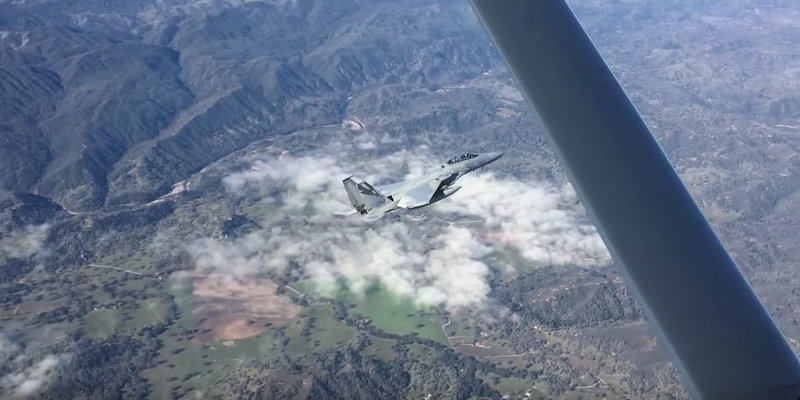 It's sort of a private pilot's worst nightmare, seeing a US Air Force fighter jet fly alongside your aircraft. Whoops, that's because you've flown into restricted airspace. And just like the airspace above Levi's Stadium in Santa Clara, California, the location of Super Bowl 50 this Sunday, a US Air Force F-15 Eagle will intercept all unapproved aircraft. A Civil Air Patrol (CAP) Cessna 182 will assist the F-15. In order to make this clear, the Civil Air Patrol recently posted the following video, taken from a Cessna 182, showing a practice intercept by an F-15 in preparation for the event. The Federal Aviation Administration also posted the video to its official Twitter; a sort of friendly reminder of the consequences of flying — unintentionally or otherwise — into the airspace. Separately, here's what you should do if you see a fighter jet or law enforcement helicopter off your wingtip.